Robot vehicles are set to patrol vital nuclear materials in the Nevada desert. Shouldn’t the Terminator movies have taught us not to entrust our nuclear weapons to robots? Oh well. The US National Nuclear Security Administration recently announced that it has started using autonomous robot vehicles to patrol the vast desert surrounding its Nevada National Security Site (NNSS). The 1360+ square miles of territory is home to millions of tons of low grade nuclear waste, as well as Cold War Era nuclear weapons, and cutting edge nuclear testing research. 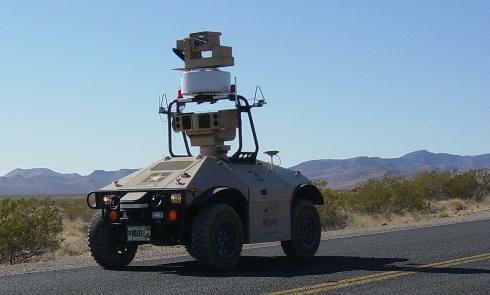 Guarding those precious nuclear materials is the Mobile Detection Assessment Response System (MDARS) robot, which is essentially a camera on a mini-Hummer. The MDARS can roam and scout the desert on its own, alerting a remote operator when it encounters something that shouldn’t be there (two headed coyote?). Human controllers get real time video feed form the bot and can communicate with trespassers using speakers and a microphone. There’s just one MDARS robot on patrol now, but NNSA plans on adding two more in the next six months. Looks like robotic sentries are going to be a mainstay in the security of nuclear power. Watch the MDARS bot protect national interests in the video below. US security forces are no strangers to robotics – we’ve employed them to both fire guns, and act as moving targets. The MDARS is a little different than most in that it is neither completely autonomous nor completely controlled. On patrol it can function on its own for up to 16 hours, using its diesel engine to power it at speeds up to 20 mph. It has enough intelligence to complete random surveillance routes, and enough sensors and cameras to notice anything out of the ordinary. Yet as soon as it encounters a target, it quickly bumps all the higher order decision making and controls to a human operator. That’s a pretty great hybrid approach to robotics. Practical applications need to match the strengths of robots (repetitive tasking) with the strengths of humans (creative problem solving and decision making) in ways that minimize the weaknesses of each. The robotic patrol system at NNSS does just that, allowing one human to be responsible for huge areas of territory he or she couldn’t patrol on their own. The MDARS actually isn't that big of a robot, but it can save facilities millions in dollars. The use of MDARS is also set to be a major cost cutting project. NNSA estimates that each robot saves about $6 million in infrastructure costs by removing the need for stationary cameras, sensors, and wired connections. Robot patrolling will save an additional $1 million a year in associated maintenance fees for those stationary systems. In short, employing robots makes sense financially as well as tactically. Which means we’re likely to see a lot more of systems like the MDARS cropping up soon. Certainly the US has plenty of test sites, military bases, and secure facilities it needs to patrol. We’ve seen how South Korea is testing out armed turrets to guard its border with North Korea. Armed mobile robot patrols may be a much cheaper solution. Of course, giving these robots weapons and placing them near vital areas does seem to be the first step towards creating some sort of science fiction inspired machine apocalypse. Maybe we should create some synthetic biotech organisms to watch the robots…that will help us cut down on hubris, right? 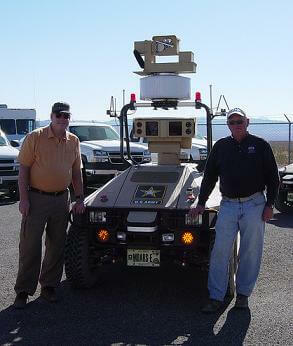 More photos of the MDARS robot at NNSS can be found at the NNSA Flickr page.